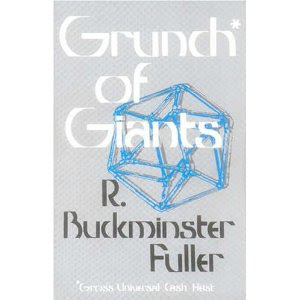 Grunch of Giants, written by R. Buckminster Fuller (as recommended by Robert T. Kiyosaki and other great students) It is a rare book and can be bought from Amazon if you can find it or scroll down and read it online below… I paid over $30 for my new copy from the US and it was worth every penny! He has a remarkable mind and is a genius if you take time to study the few artifacts he has left with us. I have been thinking about lots of things recently, watching the economy, weighing up the options and wondering where WE are all heading. 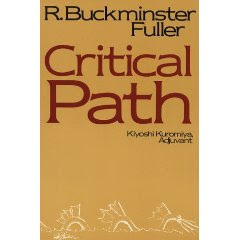 Luckily Fuller’s book has given me some more insights and verification that I am pondering the right things. Are we here to create wealth for ourselves, others or the planet? In order to understand how the Grunch works, Fuller says you must first study their history and development. In beginning his explanation, Fuller quotes one of his friends, who he called a giant. One of the first things Fuller had to do was make a decision: Did he want to try to make money, or make sense, as the two things are mutually exclusive. So Fuller decided to make sense and he used his books to explain how the world works. The book is not what you think it’s about but definitely an eye opener about the FACT that the basic cost of things is coming down due to manufacturing cost but prices continue to go up – through the artificially created ‘inflation’ designed to keep cash flowing from regular people to the Rich corporations! The only function of a corporation is to make money for it’s shareholders – it is soul-less, so the greater good of changing human life for the better is not relevant. “Gross Universe Cash Heist (Grunch)” is the theory that large corporations use the government to enforce their economic suppression of the rest of society and steal resources and assets from around the world whenever and wherever they want. 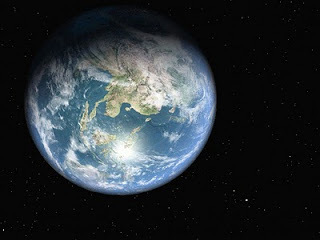 Have you ever considered if the resources of the planet and sun are becoming easier to harness? If technology is making it simpler and quicker to bring products to mass market? Are less humans required to operate said machinery to make the resources into products? If you think about it and use your intuition you will realise that the answer is yes, yet prices seem to go up with inflation not down with economies of scale. Why is this? Why does a pair of shoes, a house, a car or any other product now cost more than it did 10 years ago – should it not be less due to these economies? No – because of price fixing by corporate giants to turn even bigger profits. Greed of the few is not good for the survival of everyone. Today, one person can run an entire business by themselves on the internet from anywhere in the world. Limited resources can harness an infinite return – yet the corporates do not want to share the wealth. What choices would you make? Countries are bankrupt and can’t pay their debts, so are the banks. But they keep stealing from the public to keep themselves going. Making the mega-rich richer and everyone else poorer. What are you going to do about it? I’m starting by sharing this information with you. When the on-foot people got pikes, they were able to knock off the bullies on horses. The Internet is your pike and the people on it your network. Start a movement – share the knowledge – change the world – before it’s too late. The once visible advantage is becoming invisible, more and more like the physical’s true self in the metaphysical world. Do you have time NOT to read these eye-opening 63 pages that I have found online and shared with you? Here are the results of my information gathering for you to help with the problem solving. Please leave your thoughts and/or review as a comment to help other people comprehend the truth.